Deep cleanses and purifies for clear, problem-free skin. Himalaya Herbals Neem Face Pack is a purifying mask that helps to regulate excess oil secretion, cleans clogged pores and prevents the recurrence of pimples. Neem, well-known for its purifying and antibacterial properties, helps control acne and pimples and their recurrence. Turmeric helps remove acne-causing bacteria. Fuller’s Earth (Multani Mitti) cools and soothes the skin, improving skin texture and leaving you with clear, problem-free skin. 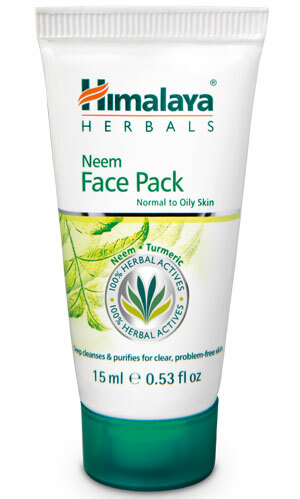 Apply Himalaya Herbals Neem Face Pack evenly over cleansed face and neck, avoiding the area around the eyes. Allow to dry for 10-15 minutes. Remove with a wet sponge and wash with cool water. Use once or twice a week. Do not apply on broken or inflamed skin.